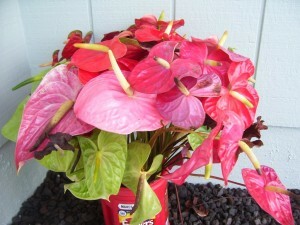 Have you ever wondered how anthurium flowers get from a farm on Hawaii all the way to your home? Well it is a very involved process and a number of people and companies have to work together to make it happen. A lot of things have to go right in order for fresh anthuriums to arrive at your door. If any one step in the process fails or is delayed, wilted flowers are the result. It all starts on an anthurium farm in Hawaii. The flowers are harvested by hand, usually with small knives that are frequently dipped in alcohol to sterilize their blades after each flower is cut to prevent the spread of a bacterial disease between plants. The flowers are then put in containers of water and stored at a farm building for pickup. Next, the distributor will pick up the containers of flowers and put them into a van. While taking the flowers to the packing facility, the driver has to drive very carefully as an unexpected stop can knock the containers of flowers over. At the packing facility, flowers are sorted and graded so that you get only the best flowers. They are then taken out of water and neatly placed in boxes that are lined with strips of paper to cushion them, while they are on their journey to your home. After packing, they are then driven to an air freight company. They can only be delivered by plane as all other modes of transportation take too long. The transit company then puts the boxes on a plane, which usually takes them to the company’s distribution hub. From the distribution hub, they are delivered to your doorstep. If there are any delays in any of the steps that I listed above, the result is wilted flowers. Furthermore, cold weather can place additional stress on your flowers as they are in transit and cause additional problems. As you can see, the path from the farm to your door is long and complex.